How to opt-out a patent / withdraw an opt-out / correct an opt-out? §. Who can lodge the applications to opt-out / withdraw an opt-out / correct an opt-out and how? According to the Rule of Procedure 5 of the Unified Patent Court: the patent proprietor or a person mandated by her are the only persons allowed to opt-out, withdraw and correct an opt-out. In case of multiple patent proprietors, the opt-out must be lodged by or on behalf of all proprietors. Opt-out on behalf of the sole patent proprietor: If the authorised user is a representative before the UPC, as defined in article 48 of the UPC Agreement, a mandate authorising the opt-out is not required. If the user is not such a representative, a mandate from the proprietor – and, if applicable, holder of Supplementary Protection Certificates- must also be lodged. This mandate must specifically authorise the opt-out. The mandate can be delivered to any person or private company. It must include the patent number, the patent holder’s name and her signature. The UPC published a template mandate which can be found below. The opt-out may be lodged on behalf of a proprietor by a registered user of the CMS. The user must be authorised to lodge the opt-out by all proprietors. She must declare in the opt-out that each proprietor is entitled to be registered as proprietor pursuant to Rule of Procedure 8.5. If the authorised user is a representative before the UPC, in accordance with article 48 of the UPC Agreement, a mandate authorising the opt-out is not required. 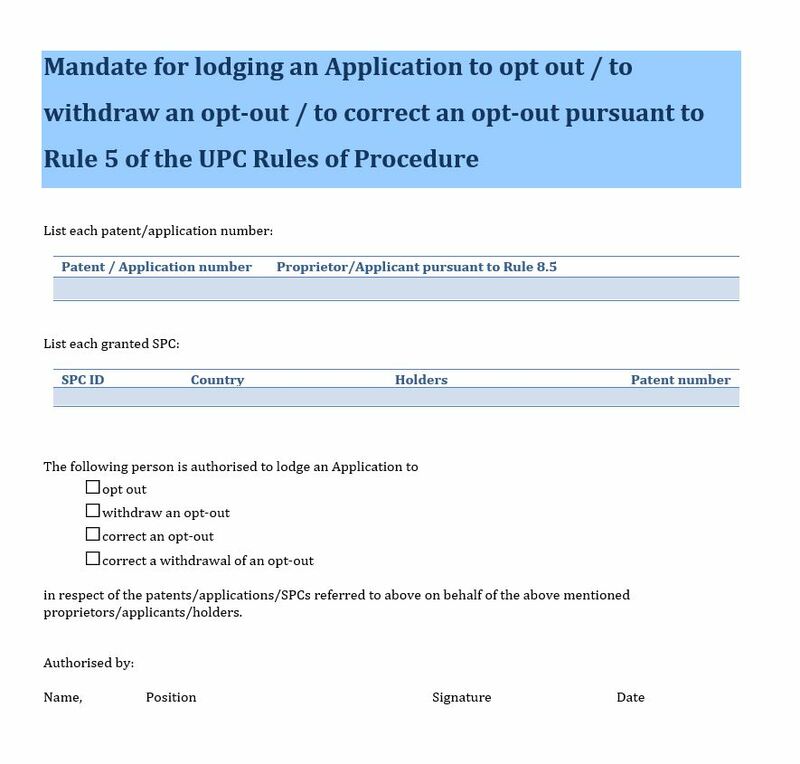 If the user is not such a representative a mandate from all proprietors and holders of SPCs must also be lodged specifically authorising the opt-out in question. §. What if Supplementary Protection Certificates (SPCs) have been granted in respect of the patent being opted-out? details of any supplementary protection certificate granted based on the patent concerned, including the number. 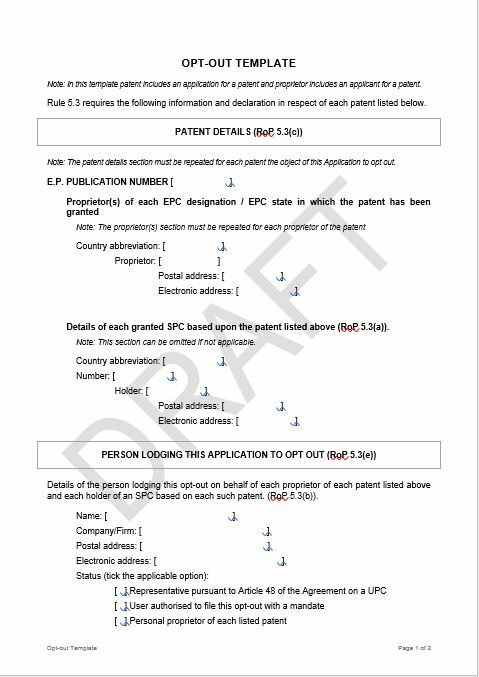 Each holder of an SPC, if different from the proprietor of the patent, must lodge or authorise the opt-out in addition to the proprietor of the patent. Such a patent must be opted out even if expired. The opt-out will be effective in respect of any further SPC granted after the registration of this opt-out. §. What are the different procedures? All opt-out requests will appear on the EPO Register. All European patents opted out will be published on the UPC website. It is not possible to opt out a European patent with unitary effect. Therefore if the application for opting-out a European patent with unitary effect is granted, the opt-out is deemed to be withdrawn from the date of grant. 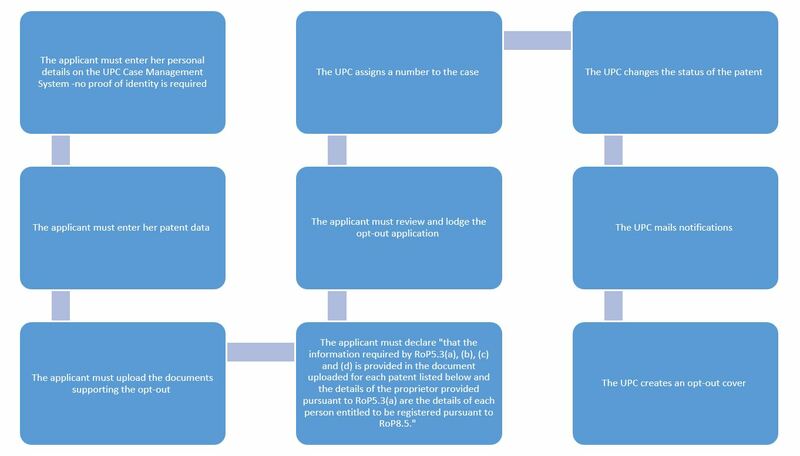 It is also not possible to opt out any patent/SPC which is the subject of an existing or prior action before the UPC. The correction procedure will allow patent proprietors to correct their opt-out. A correction of an opt-out must be lodged in respect of each patent where the opt-out data was incorrect. The correction of the opt-out procedure will -for example- be used if the patent has been opted out by someone without authority to do so in the original opt-out. 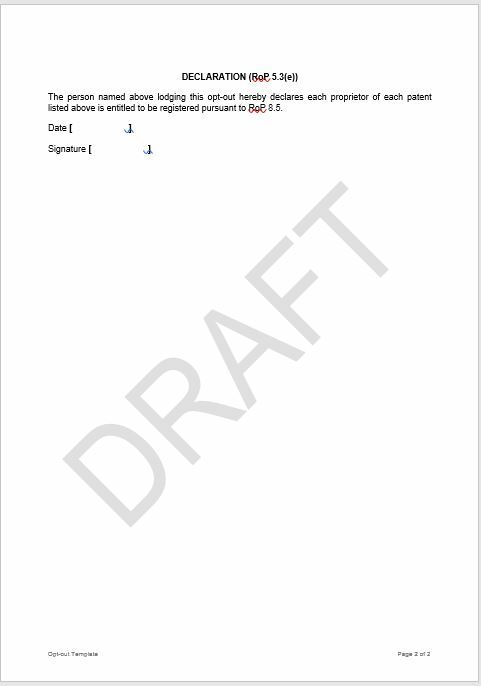 It will not however be possible to correct the patent number in the original opt-out. In this case a new application to opt out must be lodged with the correct number. Following the lodging of the correction of the opt-out, the correction date will be recorded in the opt-out register. An email will be sent with details of the corrected registration. The correction will be available to the public. Patent proprietors can withdraw their opt-out and submit their patents back to the jurisdiction of the UPC. The withdrawal of an opt-out must be lodged before the UPC Registry in respect of each patent previously opted out. Patent proprietors will be able to withdraw their opt-out at any moment, unless an action, regarding the patent or the Supplementary Protection Certificate, is pending before any national court. A patent which has been the subject of a withdrawal may not thereafter be opted out again. Following the lodging of the withdrawal of the opt-out, the relevant European Patent published application number will be removed from the opt-out register. An email will be sent to the patent proprietor with details of the withdrawal. These details will be available to the public. As it is not possible to correct the patent number in the original withdrawal, a new application to withdraw an opt-out must be lodged with the correct number. A correction of a withdrawal of an opt-out must be lodged in respect of each patent where the withdrawal data was incorrect. Following the lodging of the correction of the opt-out withdrawal the date of correction will be recorded in the opt-out register. An email will be sent to the patent proprietor with details of the corrected registration of the withdrawal. These details will be available to the public. §. When will the opt-out take effect? An opt-out lodged before the date of entry into force of the UPC Agreement will be treated as lodged on the date of entry into force. Following the lodging of the opt-out the relevant European Patent published application number will be recorded in the opt-out register. An email will be sent to the patent proprietor with details of the registration. These details will be available to the public. All corrections and withdrawals will take effect respectively from the date of correction and date of withdrawal. §. 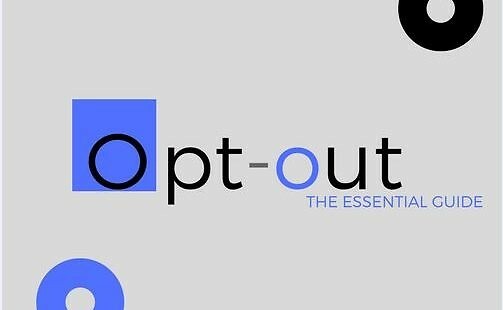 How much will it cost to opt-out? The Preparatory Committee confirmed that there will be no fee for the opt-in nor opt-out procedure.